Your ENART 911 puts the power in your hands. The ENART 911, is the flagship device from ENART developed by specialists at CCC Invet independently without Doctor Karasev. While undeniably the sleek lines of the old “ex735 slider x2″ are legendary combining Star Trek wizardry with beauty but the new 911 model brings in greater range of application, model design functionality and 3 built in electrode design choices of which the three rail design is my favorite. I use a lot of different SCENARs in my practice and I love the engine in the ENART 911 and with my training and professional daily PRACTICE it will surpasses the COMODIC SCENARs, RITM and DENAS devices. Like a Ferrari you can only experience the benefits after a lot of high speed training and practice driving. Perfect practice make perfect. I have personally used the ENART 911 since 2009 and for certain situations in a busy practice it is my preferred device. If you have followed my work over the years you will know that I use the much simpler now discontinued DENAS most of the time. However no other device touches the feel of the signal, the speed and read-ability of diagnostics mode of the ENART 911 with its large display and 3 rail electrodes. So the ENART 911 is an amazing unit especially for professionals, and the various modes I talk about in the video are good for any emergency imaginable, awesome power (if and when you need it), and so many programmable functions that you might get easily lost, but not with my videos and coaching! This mode is used for addressing a wide range of conditions, both chronic and acute. • The value of Frequency automatically changes according to the body response at the moment of each particular skin contact. • The Device produces three short tones at the sites where additional specific time is needed. •Determines maximal sufficient time at each particular position of the Device electrode on the skin. This allows to regulate purposefully the activity of the specific CNS (central nervous system) structures and, as a result, to elicit more rapid and stable homeostasis. 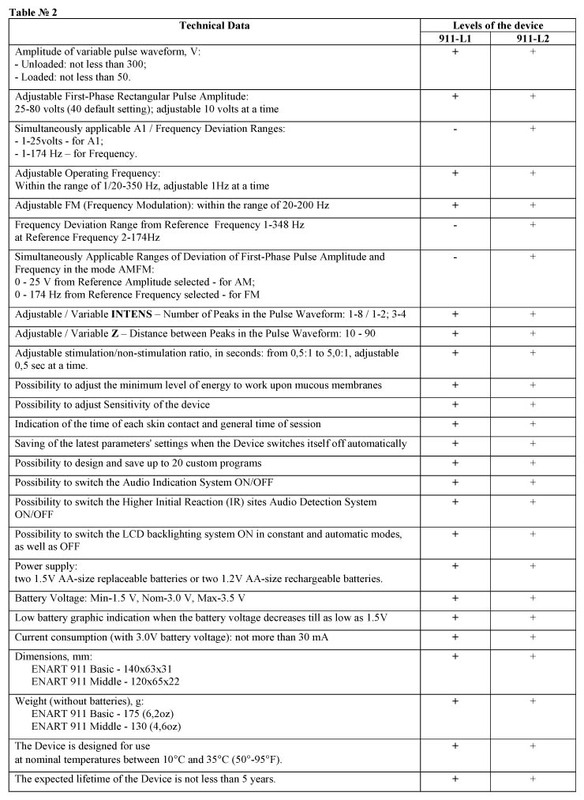 User may apply infra low frequencies (like the DiaDENS PCM – see my video) according to the table attached to User Manual (where the resonance frequencies for different organs and systems are mentioned about. 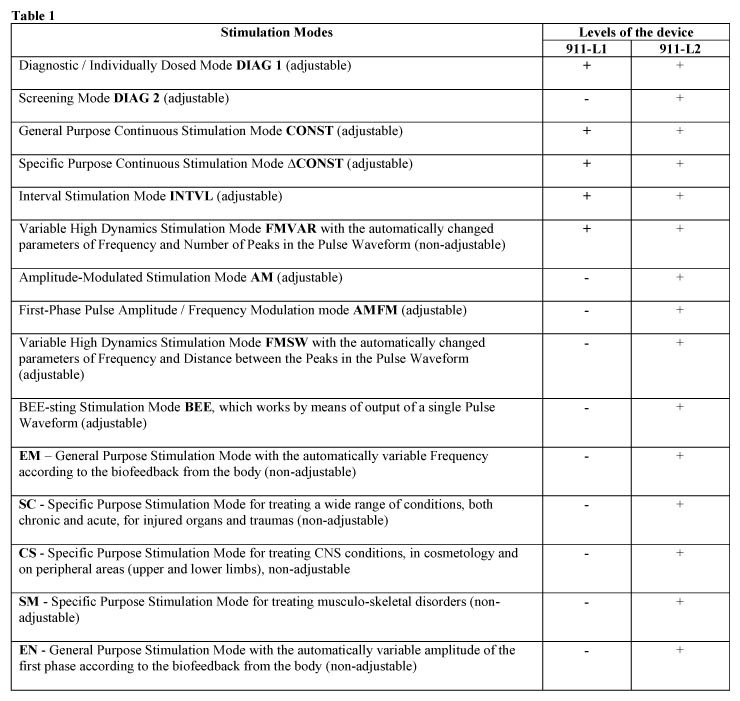 All regular Avazzia, SCENAR and DENAS devices the first-phase rectangular pulse amplitude remains unchanged, while the second-phase oscillating pulse amplitude varies in accordance with the body’s response to the influence of the device. Many practitioners who use several different devices made by DENAS, SCENAR or Avazzia have noticed that each particular model is most effective for different specific conditions. For instance, some devices are more efficient in adressing musculoskeletal disorders while others are best used for internal organs; still others are more effective for addressing diseases of the nervous system, etc. Now, for the first time, with the ENART 911 and 907 device (levels L1 and L2), the practitioner can adjust the first-phase pulse amplitude within the range of 25V to 80V. By allowing the practitioner to adjust the first-phase pulse amplitude the ENART 911 can more effectively address the whole range of diseases/injuries with only one device. The customer/practitioner will now only have to buy one device to address the whole range of diseases rather than having to buy different devices in order to address different specific diseases. None. Special order only 3 - 4 weeks delivery.